The letter of First Peter was written around the time Rome was burned by the emperor Nero. The persecution of Christians had been steadily increasing. Peter writes this letter to Christians throughout the Roman Empire to show them how to live victoriously in the midst of the coming hostility, without losing hope, without becoming resentful, and by trusting The Lord. 1 Peter is about looking forward in hope. Even in times of suffering, there is so much to gladden the heart and to thank God for. His gift of new life through the resurrection of Jesus which gives us living hope. 1 Peter 2 verse 1 So rid yourselves of all wickedness, all deceit, hypocrisy and all slander. God’s own people chosen to make known the wonderful things He has done, living stones being built into a spiritual temple that rests on the foundation stone of Christ Himself. We have a special mission as followers of Christ to capture the world for Christ. Christians must control themselves to stay true to their real identity. 1 Peter 5 verse 8 Be sober Be on the alert. 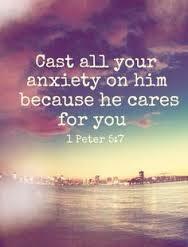 1 Peter 5 verse 7 Leave all your worries with God because He cares for us. The purpose of 1 Peter is to lift us up and fill us with joy. Peter who is an apostle of jubilant hope, addresses this epistle (letter) to the strangers scattered everywhere. A letter for homesick Christians. A letter where Peter tells those persecuted and discouraged of a near and precious savior. What privileges we have as Christians (followers of Christ). We have everything in Christ that God wants us to possess. God has given us in His Son, and He will freely give through His Son all things. To summaries: Peter composed this letter to Christians who were experiencing persecution because of their faith in Christ, He wrote to comfort them by reminding them of their salvation and the hope of eternal life. He challenges them to live holy lives and to realize that those who suffer for their faith become partners with Christ in His suffering.Be blessed as you read 1 Peter afresh, and glean the excitement of knowing Our Lord and Our Friend more, even from the difficult times these brothers and sister in Christ were having when Peter wrote the letter.